VALUE AND MARKETABILITY – IS THERE A DIFFERENCE? Ending the year with roughly as many positive outlooks as there were negative, it is unsurprising that the fourth and final quarter of 2018 would yield slow but steady results. However, without any curve ball spikes in numbers, and with most figures revealing shoots of minor growth, the fourth quarter could easily be described as good news to the risk averse investor. “Exiting the recession and a lowering of fuel prices were just some of the positive announcements made during the last quarter of 2018. However, these positives were offset by Eskom’s continued struggle to keep the country’s lights on and the announcement of raised interest rates in December. 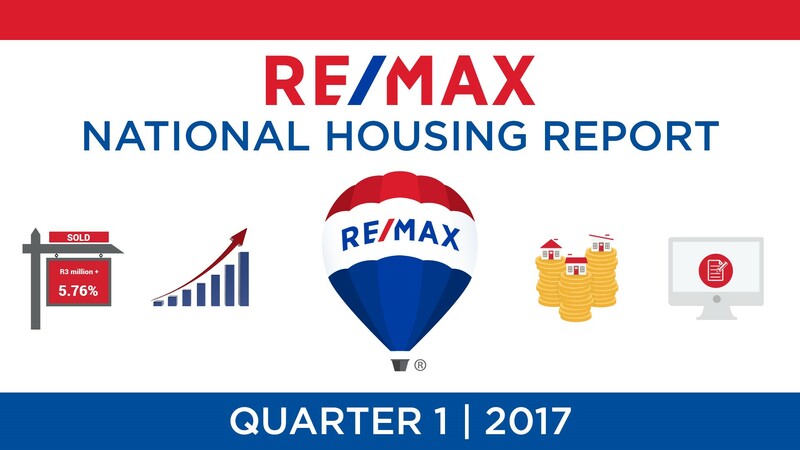 Consequently, the results of the fourth quarter seem to reflect a hopeful yet reserved property market,” says Regional Director and CEO of RE/MAX of Southern Africa, Adrian Goslett. Over the period of October - December 2018, a total of 42,248 bond registrations were recorded at the Deeds Office, totalling an amount of R45,860,040,000. This translates into a 5.4% increase in the amount of bonds registered in the previous quarter – the exact same percentage by which the number of transfers increased in the third quarter. Lightstone Property also recorded a total of 48,661 bonds cancelled during the fourth quarter – 6.8% fewer than were cancelled in the third quarter. “There are various reasons why people choose to cancel their bond, one of which being that the bond holder has decided to sell their property. This drop in the number of recorded bond cancellations could reflect the ‘wait and see’ sentiment which I would attribute to our current market,” says Goslett. The number of transfers (both bonded and unbonded) recorded at the deeds office between October and December increased by 3.1% from the third quarter to 62,150 transfers in the fourth quarter. Of these transfers, a total of 29,143 freehold properties and 15,648 sectional title units were sold countrywide (*these figures exclude estates, farms, and land only transfers). 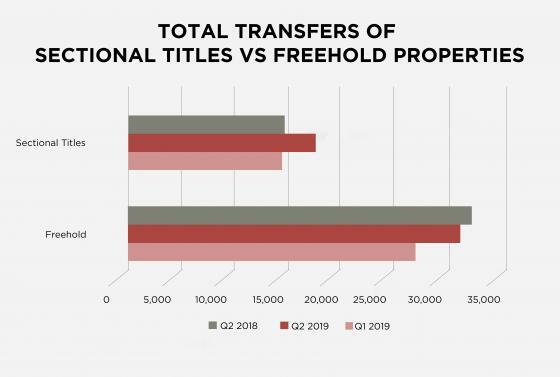 “While these figures translate into a 3.6% drop in the number of freehold properties sold in the third quarter, they also translate into a substantial 8.1% increase in the number of sectional title units sold. This reveals a considerable shift in the market away from freehold titles and towards sectional title living,” Goslett explains. In the fourth quarter of 2018, 29.5% of transfers fall within the R0 – R400,000 price range, positioning it with 1.8% less share of the market than it held in the third quarter. Steadily catching up to this segment, 25.6% of bonds were priced between R400,000 and R800,000, increasing its market share by 1.4% in the fourth quarter. At 0.6% higher than last quarter’s market share, 24.9% of transfers were priced between R800,000 and R1,5 million. Remaining steady from last quarter’s market share, 15% of transfers were between R1,5 million to R3 million; and, transactions over R3 million dropped by 0.2% to account for 5% of all bond registrations for the fourth quarter. 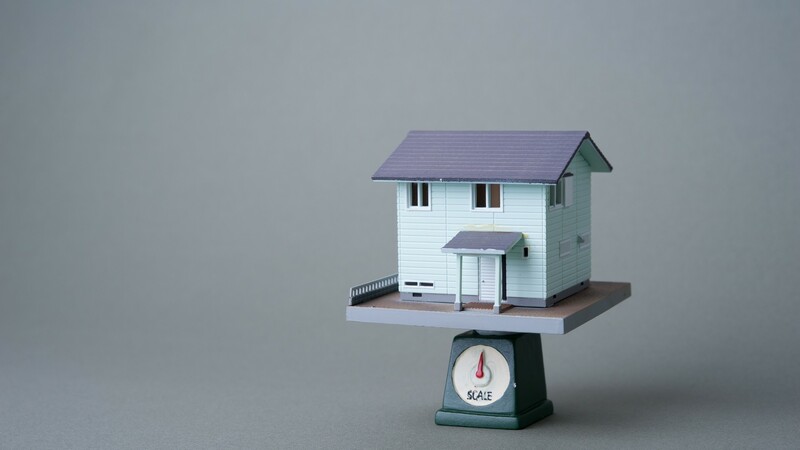 “The figures from the fourth quarter continue to reflect the reality revealed in the third quarter of a market that is shifting beyond the reach of entry-level buyers and in favour of the middle-income buyer,” Goslett explains. House prices continue to reflect minor growth this quarter. Lightstone revealed that the current national median price of a freehold home now sits at R1,070,225 which translates into a 2.15% growth since the third quarter (slightly lower than the 4.3% growth we experienced in Q3). Likewise, the national median price of a sectional title grew by 0.13% (down from 0.9% growth in the third quarter) since last quarter to R1,021,645. The average active RE/MAX listing price for this period dropped by 5.4% and amounted to R2,449,359. What’s more, the average bond amount granted during this period saw a somewhat insignificant drop of 0.1% to R1,085 million in the third quarter. “For those hoping to invest in property in the year ahead, KwaZulu-Natal spiked in popularity in the fourth quarter, stealing two of the top five positions for the most searched suburbs on remax.co.za. At this time of year, this spike could possibly be largely attributed to the holiday destination quality of these suburbs. However, the province has shown some other signs of growth in 2018. According to Private Property statistics, KZN tied for second place with the Northern Cape for the highest median asking price in the country, managing to sneak ahead of Gauteng at a R1,550,000 median asking price. 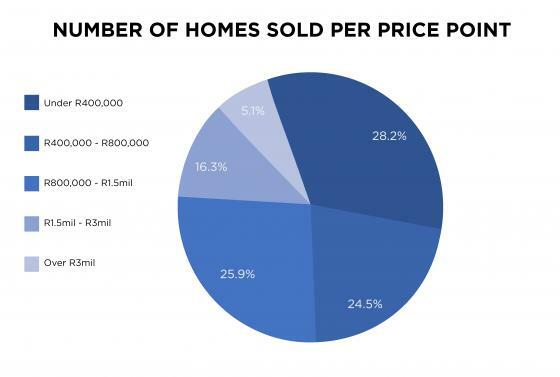 Of course, the Western Cape continues to be the highest priced province with a median asking price of R2,561,130. But, particularly with the various new developments emerging on its coastline, KwaZulu-Natal promises to be a province investors ought to keep an eye on in 2019,” Goslett concludes.